On the weekend October 19 to 21, 2018, at the recently concluded biennial national conference of the Filipino Communities Council of Australia in Perth, , Ms. Carmen Garcia made history when she was elected as President of the Filipino Communities Council of Australia (FILCCA). 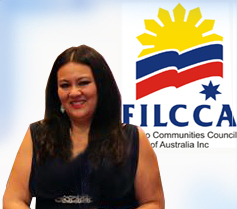 A dynamo, gearing for change for Filipinos, she is the youngest president of FILCCA and the first Filipino born in Australia to take over the helm. Her FILCCA team includes: Cecile Wheare, Vice President external (Victoria); Roberto Garcia, Vice President internal (Queensland); Veronica Pantos, VP Youth (WA), Ben Hur Winter, Secretary; Serna Ladia, Treasurer (NSW); and Cecille Flores, PRO (ACT). FILCCA officers are elected for a two-year term. L-R: Consul San Agustin, Carmen Garcia, Roberto Garcia, Cecille Wheare, Veronica Kempster, Ben-Hur Winter, Serna Ladia and Cecille Flores. 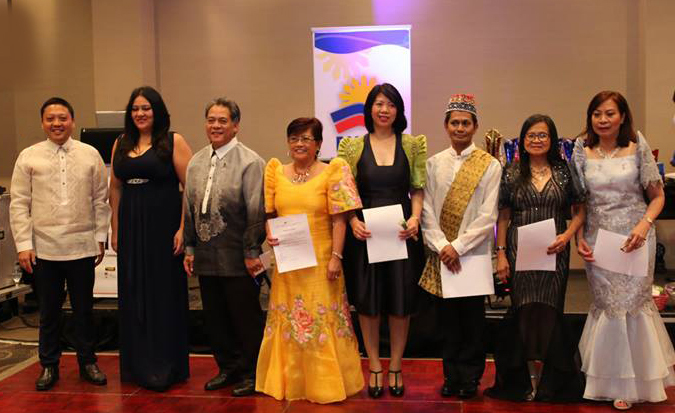 FILCCA has been in existence since 1990 and for years has represented the needs and concerns of of the ever growing Filipino population in Australia. There are now 248,000 Filipinos in Australia and Filipinos are now the 3rd largest Asian community and the sixth largest ethnic group. Dante Maribbay, outgoing FILCCA president said “Congratulations to Ms. Garcia. I hope her presence will pull in the youth we so desire.” Mr. Maribbay and his Perth team graciously hosted the 15th FILCCA conference. A multi-award winner, Ms. Garcia hits the ground running. As a mother of two, she hopes to raise the profile of Filipinos in Australia. Ms Garcia said, her decision to run as President was based on her belief she could do better. With her existing connections, she hopes to change the narrative, and use her influence to raise the profile of the Filipino community. “We fill key roles in the workforce both in metropolitan and regional Australia. Our contribution in the health industry, small business sector as well as professional services has been somewhat under-valued. We are proud of the way we have given back to this country and yet we still remain somewhat overlooked in leadership and political representation. I believe, this needs to change. We need to demand a seat at the table.” said Garcia “I want to help showcase the people of my community and the profound impact we make in our society” she added. When asked about her priorities, she said she was determined to actively seek investment support for a research study to quantify the economic and social contributions of Filipinos to Australia. Carmen is founder and managing director of Community Corporate, a national award-winning diversity and inclusion firm. She works with the Australian business sector on corporate social responsibility and has helped hundreds of refugees and migrants across Australia access work and pursue their small business dream. She also currently sits on the Federal Government’s Settlement Services Advisory Council, where she chairs the Regional Migration and Settlement Committee. Some of the many honors she has received include: Telstra Business Women’s Awards top 3 finalist in her for purposes category in 2017; Silver award recipient of the rising star award at the Ausmumpreneurs national awards 2017; and the only Australian listed in the 100 Most Influential Global Filipina Women Awards in the Philippines in 2016. She remained humble in her acceptance speech as she acknowledged the former FILCCA leaders whom she hoped would be there to share with her their wisdom and provide her with guidance and advice. The next FILCCA conference is scheduled for October 2020 and will be held in Adelaide, Ms. Garcia’s hometown.